Outgoing PPP general secretary Clement Rohee did not re-contest the position against de facto party leader, Bharrat Jagdeo, instead nominating Dr Frank Anthony who lost against Jagdeo by 13 votes. 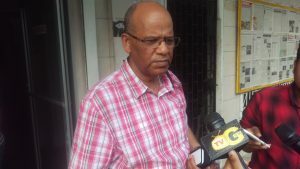 Jagdeo, the party’s incoming General Secretary, spoke with the media after his win today saying his positions as PPP General Secretary and Opposition Leader allows for a consolidation of the two posts and a focus on growing the party as well as preparing the party to head back into government. Speaking on whether he will emerge as his party’s next presidential candidate, Jagdeo said that issue will be decided when it is time. At his party’s recent Congress, Jagdeo had said it was time the party focussed more on what is good for Guyana rather than ideological “isms”. Now as General Secretary, Jagdeo said his party will reach out to all of Guyana as opposed to focusing solely on its traditional support base. Clement Rohee, on the other hand, expressed his disappointment that his candidate for General Secretary, Dr Frank Anthony, did not win against Jagdeo. Rohee said however he will continue to support Jagdeo since the PPP is a collective unit. “I believe he is young, he has a freshness about him, he had the second highest votes at the Congress, and he is a young professional. Therefore.. I thought it was better for me as an older person to step aside and give a younger person an opportunity to be the General Secretary,” Rohee said, commenting on his reason for supporting Anthony against Jagdeo. “The PPP is fortified and prepared for 2020,” declared a smiling Gail Teixeira who was re-elected to the Central Executive Committee by secret ballot. Also on the incoming Central Executive Committee are Dr Roger Luncheon, and former President Donald Ramotar. The socialist-oriented Marxist-Leninist party has over the years, while in government from 1992 to 2015, embraced market-oriented polices rather than a dominant role of the State in economic development.